A unique collection of 263 small molecules with biological activity used for Immunology/Inflammation research. • Gastroenterology . 2018 May;154(6):1822-1835.e2. • Circ Res . 2018 May 25;122(11):1532-1544. • Nat Commun . 2019 Mar 4;10(1):1015. • Nat Commun . 2016 May 25;7:11724. • Ann Rheum Dis . 2016 Apr;75(4):730-8. • Ann Rheum Dis . 2016 Apr;75(4):721-9. • Nucleic Acids Res . 2018 Apr 20;46(7):3284-3297. 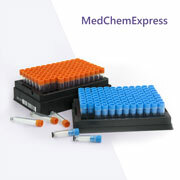 • A unique collection of 263 small molecules with biological activity used for Immunology/Inflammation research. • The library contains compounds targeting Immunology/Inflammation-related enzyme such as CCR, COX, Interleukin Related, IRAK, MyD88, PDE, PD-1/PD-L1, TLR, and more. • A useful tool for researching the mechanism behind Immunology/Inflammation, drug screening and other pharmaceutical and biological applications.